Farmers can measure fields, boundary distances & calculate areas. Estate agents can measure land parcels easily. Route planners can measure road dictances. If you have an image then we can measure from it - quick & simple. No mapping software, or higher knowledge required! Scan it. Scale it. Measure it! Free download! Free Upgrades! Free Support! Only £39.99 for full version! Field Track - Map Measure is a small, simple, and cost effective solution to measuring distances, areas and angles from scanned images (maps). This is a completely free to download and use map/image measurement system. Field Track - Map Measure was designed to cover a very obvious need for farmers - a simple and cheap program to measure stuff with! High ownership and support costs, as well as, difficulty learn and use are the main drawbacks of many similar tools currently available. In fact many similar packages are over priced for the simple task of measuring an area of your field. Field Track - Map Measure is to allow extremely simple and fast use of your field images and maps. Field Track - Map Measure is also currently totally FREE to download and use in a restricted fashion. If you register Field Track - Map Measure for the insanely low price of £39.99, you will gain access to several extra features and also stop any 'nag' screens from appearing. Field Track is continually providing simple and effective computer solutions for farmers and related industries. If, on the other hand, you have a scanned image file of a map on your computer and want to quickly scale and mark out measurements upon it - simply and quickly, then Field Track - Map Measure is an ideal and cost effective solution for you. What possible uses might you have for Field Track - Map Measure? Farmers can measure fields, areas, hedge lengths for ELS, as well as boundary areas. 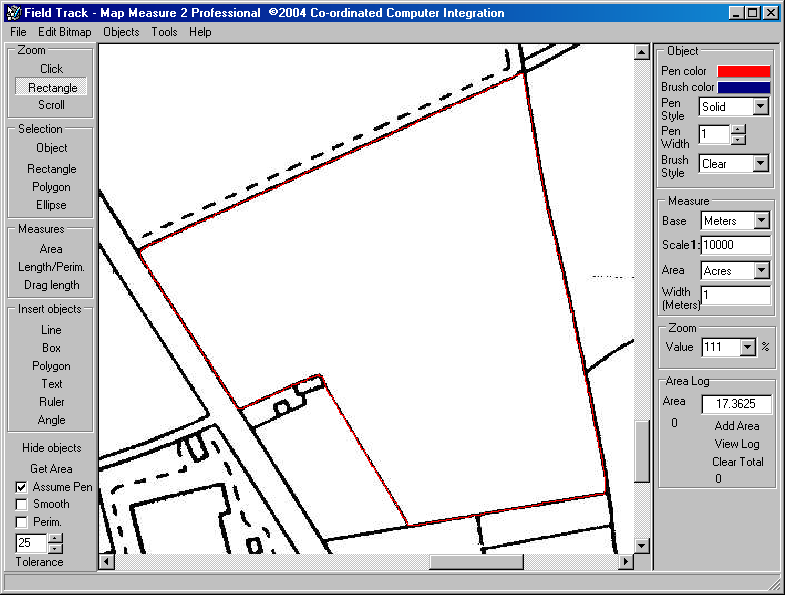 Estate agents will find this ideal to measure land parcels and plots. Measure distances between points - taxi routes, railway tracks, anything you can imagine. Floor plans, building sites, line drawings and picture images. We provide the basic shell - it up to your invention how you use it! Field Track - Map Measure is currently free to download and use in a slightly restricted manner (some features do not work). Be sure to download your copy today before we change our minds! © Copyright RedkiteIt Limited All rights reserved.